Since it’s my birthday – let them eat cake! The famous phrase – “let them eat cake” – is often attributed to the ill-fated 18th century French queen, Marie Antoinette. The phrase in fact comes from her contemporary, best-seller serial writer Jean-Jacques Rousseau. “Finally I recalled the stopgap solution of a great princess who was told that the peasants had no bread, and who responded: ‘Let them eat brioche [fancy bread, or cake]’,” he wrote in 1769 in volume six of his largely fictional, but racily scandalous, “Confessions” (published in 1782). He was describing his temptation for pastry to accompany wine he had just stolen. Just which princess he was referring to is not clear, but it was not Marie Antoinette who was only 14 at the time, and had not yet arrived at the French Court at Versailles. There are three quite different, but simply excellent never-fail cake recipes that we have adapted and used for many years at KwaKhehla: boiled fruit cake, banana (carrot) cake, and chocolate cake. In today’s blog we talk about the first. 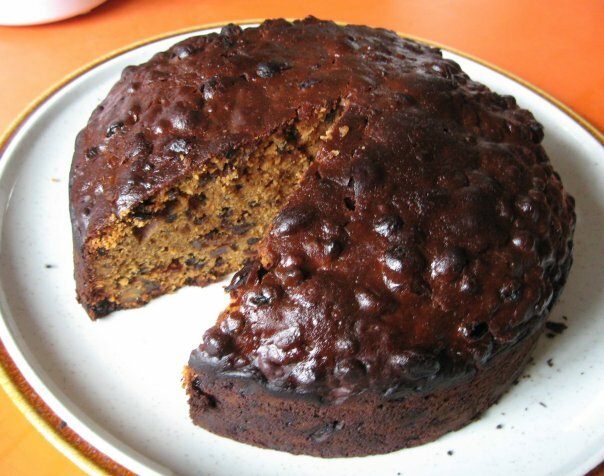 Nan Elsworth’s never-fail boiled fruit cake. Nan Elsworth’s never-fail fruit cake. I met Nan Elsworth, 94, on Leisure Island, Knysna, in April 1986. Despite her great age she was still very active with her favourite occupations – gardening and working on her recipe book in the kitchen. She had invited me to tea and served slices of a fruit cake she had baked the day before. It was so good I asked for the recipe which we have used every year since then. I never found out whether she managed to publish her book. Put all the ingredients in a saucepan and boil gently for 25 minutes, stirring to prevent burning. Remove from heat and allow to cool to finger warm (if you can put your finger in and keep it there without screaming, then it is probably cool enough). Option (highly recommended): add a handful of broken, shelled walnuts or pecan nuts and a handful of glace cherries. Pour mixture into a medium (21 cm diameter) cake tin with removable bottom, lined on the bottom and sides with grease-proof paper. Bake at 180 degrees Celsius for two hours. If you have an oven that tends to get a bit hot then bake for 20 minutes at 180 degrees C and then turn it down to 160 degrees C (320 degrees F) for the remainder of the time. Turn out the cake while still warm, running a knife between cake and bottom plate to gently part the two. Peel off the grease-paper from the bottom of the cake and let stand on a cake rack to further cool. At this stage we usually prick the top and pour on half a glass of Old Brown sherry (but you can use brandy or what-ever takes your taste). Once cool wrap the cake in foil. You can eat it straight away, but it will also keep perfectly well for weeks. Wonderful to eat, wonderful to give as a present.